If you guessed things used to describe a badly over cooked burger, ding-ding-ding, you are correct! Of course all these super well done burgers are made with your health in mind. It’s been drilled into our heads that ground beef needs to be cooked to at least 71 C. As a result, pink in a beef burger is very bad and will lead to an apocalyptic mass e coli outbreak or a least make you very ill. Or will it? Whenever I traveled in the US and eaten at independent burger joints and restaurants (not chains or fast food) I’ve always been asked what level of cook I want for my burger. I’ve always asked for medium or medium well and have always enjoyed a juicy burger without getting sick. Trust me I don’t want to get sick from e coli; it’s a nasty bug that can be deadly. If the restaurant I’m eating at buys their patties or makes their patties from ground beef from a wholesaler, please give me a hockey puck burger. Under these circumstances, the restaurant has no clue what parts of the cattle went into that patty and therefore cannot vouch for the quality of the meat or guarantee the meat has not been contaminated. However, if a restaurant buys a whole cut of beef (like chuck) from a reputable supplier, grinds the meat themselves, maintains high standards for cleaning their grinder and uses that meat to make their own patties on site, then I would feel confident in eating a pink burger from that restaurant. Given these conditions, I think you are assuming the same risk as ordering steak tartar. However there are a few burger places willing to take the time and put their reputation on the line to serve a quality juicy pink burger. 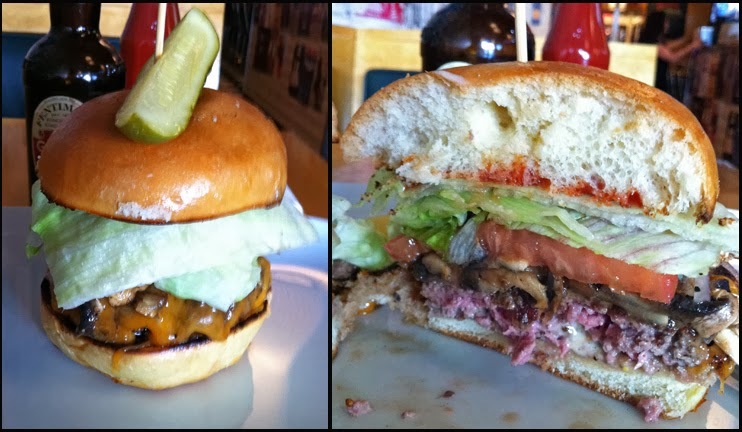 Here are some eateries I found in Greater Vancouver who serve medium and medium well burgers. Thoughts on the Burger: The 6 ounce patty was very juicy and prepared medium as I ordered. I thought the beef in patty was packed loosely. The meat was ground a little more coarsely than the grind you would see in ground beef from the super market. I thought the burger was definitely smaller in comparison to other burger joints. The beef had a milder taste and I thought it was a bit under seasoned. Overall I found the burger not as flavourful. Personally I don’t like iceberg lettuce as it has as much flavour as water but it did add a crunchy texture. I also didn’t really taste the onions, which I was surprised about. Overall, all the ingredients were fresh but some of the veggies didn’t contribute much to the burger. 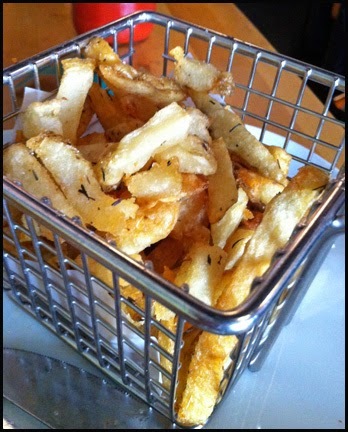 What’s a burger without fries: I really liked the shoe string fries from Cannibal Cafe. Crisp and seasoned with herbs (I detected rosemary), I thought these fries were tasty. Did I get sick afterwards: Nope, Cannibal Café’s burger and me got along just fine. Opened for: 8 years (since 2005) – I think Fraser Health has had a lot of time to check up with them and honestly if their burger made people sick they would have shut down by now. Thoughts on the Burger: My burger was cooked medium well as advertised on the menu. The burger was moist and the patty had some charring on it. 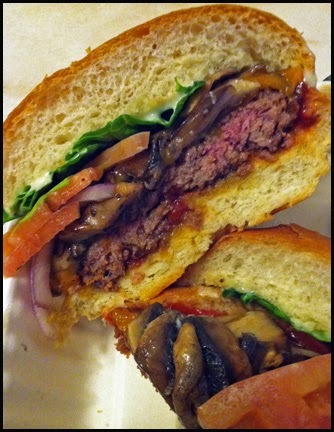 I thought the meat had a finer grind than Cannibal Café and the patty was packed more tightly. The burger was seasoned well and beefy tasting. The veggies were fresh and crisp. The toppings in Burger Etc’s burger were more present and accounted for in terms of adding flavour and texture. Overall, I found Burger Etc’s Burger was tastier as I thought each component of the burger made an impact. What’s a burger without fries: As much as I like the burger, the fries offered by Burger Etc are generic and average (sorry, forgot to take a pic of the fries). Did I get sick afterwards: I’ve had Burgers Etc’s burger a lot over the years and I’ve never had an issue. As much as I titled this post a Food Rumble and prefer Burger Etc’s burger, the number of eateries that serve Pink Burgers in the GVRD is rare. As a result, I hope you all think of this post as a guide of where you can find medium + burgers in the city and give them a try. If you know of any other places that purposely serve their burgers less than well done let me know. I would like to check them out and add it to this Pink List. Thanks in advance.